It is through inventiveness, resourcefulness and dedication that ROSEN has successfully completed yet another challenging project. In an extraordinary team effort, the experts in Oldenzaal were responsible for the conceptualisation and execution of the solution, while the professionals in Lingen combined the necessary elements to produce the final inspection tool. Borealis, a Vienna-based producer of polyolefins, base chemicals and fertilizers, contacted ROSEN regarding the inspection of metal loss on a 35 m unit riser at their plant in Kallo, near Antwerp (Belgium). The unit riser contains a medium that generates very high temperatures through chemical reaction. Therefore, the 24 in. pipe is placed within a 28 in. pipe filled with water, which acts as a cooling agent for the inner pipe. The nature of this particular installation eliminated external inspection as a viable option. The pipes are situated vertically in a riser tower and, in the context of this project, could be accessed from the top side only by means of a flange. The resulting challenge was threefold. First, a controlled descent of the inspection tool must be guaranteed. Second, a method for retrieving the tool must be devised. And third, absolutely no other objects could be allowed to fall into the pipe, as there would be no means to retrieve them. Finally, the inspection had to be carried out within a set period of three days during a scheduled shutdown of the pipeline. This left no time for repairs, fixings or similar activities, hence first run success was an absolute necessity. The aim was to find both internal and external corrosion with a detection threshold of 20% for pitting and thinning. It was decided that EMAT (electromagnetic acoustic transducer) Lamb Wave would be the inspection technology best suited for this task. 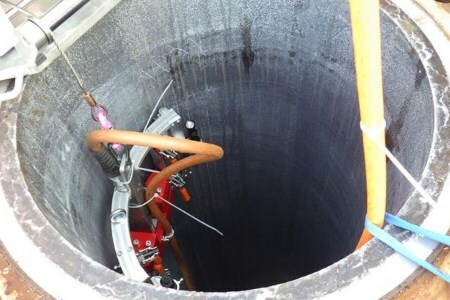 To this end, the inspection tool, which is usually used externally, was modified in such a way that it could be placed on the inner pipe wall. An electrical winch was mounted onto the pipe flange and attached to the tool as a means of controlling the speed and retrieving the tool again. The tool scanned 400 mm wide strips vertically downwards and upwards. A total of six strips per pipe were scanned to cover the entire inner surface. The use of EMAT technology provided a full body scan of the pipeline instead of mere spot measurements, as is typically the case with UT/WT. In this way, the operator receives accurate and detailed information on the status of the asset’s entire surface. Profound expertise and thorough testing ensured that the inspection could be performed within the given time frame and produced results that were to the customer’s complete satisfaction.